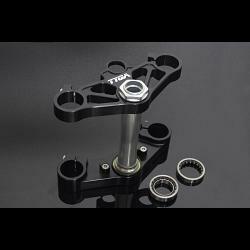 CNC machined TYGA triple clamp set for your VFR400R/NC30. These stylish, all aluminium triple clamps are a direct replacement for theVFR400R/NC30, and with the help of FEA testing not only do they look fantastic, but they perform! They are delivered ready to fit with all bearings and lower seal, and even an aluminium top clamp nut, to complete the transformation. The top clamp has the 'bolt-on' ignition switch/lock holder fitted, which can be removed for racing. Designed and CNC machined in house by TYGA from aircraft spec 6061-T6 alloy.